Plan a Visit With Us When Attending the New Ulm Quilt Show! 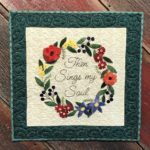 — Sewing Seeds Quilt Co.
You are here: Home / Blog / Plan a Visit With Us When Attending the New Ulm Quilt Show! Plan a Visit With Us When Attending the New Ulm Quilt Show! Make plans now to attend the New Ulm Prairie Piecemakers Quilt Guild QUILT SHOW, March 18 and 19, 2016! New Ulm has truly become a quilter’s destination boasting three local quilt shops and a well respected quilt show. While in town be sure to pay us a visit! We proudly offer hundreds of beautifully displayed samples, 3,000 bolts of quality quilting fabrics, as well as kits, gifts, wool and Valdani thread. Please visit newulmquiltshow.com for additional show information.